Barbara Jabaley feels very lucky to have been invited as one of the founding board members of Cigar City Club (CCC), a place she finds very comfortable and welcoming to women. She also enjoys the social and friendly nature of the staff and patrons alike. In her view, CCC is a place where you can meet a lot of people that genuinely like each other. She relishes the relaxing atmosphere on quieter nights and the times when her favorite mixologists are on duty. For Barbara, the perks of CCC membership are the food and cigar discounts, space reservations and quite simply the exclusivity it brings — who would want to miss out on the superb member only parties? If you’re fortunate to run into Barbara at CCC, you will experience an immediate draw to her friendly and upbeat personality. Many can recall her celebration of 30 years in business as the owner of Jabaley Hair Salon held at the club a few years ago. Barbara also has fond memories of this celebration and insisted CCC remained open to the public for the event so everyone could take part and celebrate alongside her multitude of invited guests. That night caused a traffic jam on Roswell Road with many interested in stopping by to see what was going on! It’s no surprise Barbara has now reached 33 years in the hair salon business; she comes from a family of entrepreneurs and learned quickly after a few years of working for someone that she was not born to have a boss! Barbara is able to balance her very successful hair salon with her real estate referral business and independent agent along with her personal interest in wedding ministry. Yes, she officiates weddings and became certified in this area after the nudging of close friends that wanted her to perform their nuptials. While she had prior experience planning wedding events and providing beauty services for such occasions, she never thought she would be on the other side officiating them. This has become an unexpected, enjoyable business for her that has spread by word of mouth and her natural encounters with others. It was wonderful to learn that after developing a friendship over cigars with a CCC patron over time, Barbara officiated his marriage to his wife this past December! 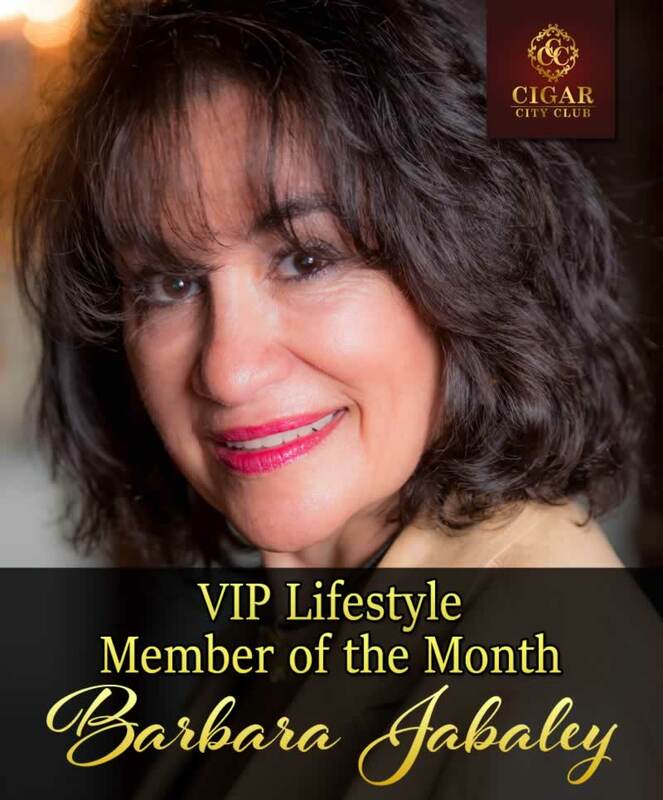 Barbara Jabaley is a true extension of the friendliness that embodies this establishment, it’s a great pleasure to have her featured as Cigar City Club’s VIP lifestyle member of the month!